A lot of what we do in a TPR classroom is non-traditional. I’ve seen and taught numerous TPR lessons that spent little or no time on activities that are now considered the “great traditions” of a foreign language curriculum, such as InfoGaps and situational conversations. And I’ve seen students achieve more than in courses where those textbook-perfect activities are commonplace. The question that I hear is, “But what if I want to use these activities in my class? What if I’m required to use them as part of my curriculum or assessments?” Well, the good news is that you can incorporate all kinds of traditional activities as part of a TPR lesson. The better news is that the results are often impressive. Yes, even though TPR students spend most of their time doing goofy, unrealistic things in class, they can still handle traditional activities and assessments thrown their way. I wouldn’t say that I use these types of activities often, but I do include them in my curriculum. I want my students to be prepared for anything they might encounter in a college-level foreign language class. And in the minds of some students, these activities are the real proof that they’re learning something. They really could go order food in a French restaurant or get directions around town – they really could communicate in French if they needed to. I let my students dictate how often we do these types of activities. I like to do them once a quarter or so to bring multiple topics together; students who are comforted by the textbook enjoy the correlation. If the students really seem to enjoy them, we can always do more. This activity was correlated to Chapters 5 and 6 of Bon voyage Level 1. The students learned the vocabulary through TPR and TPRS and then used those words and expressions to create scenarios for grocery shopping. I let students use scripts because I wanted them to include a lot of content, including old TPR-based lessons like prepositions, and wanted them to focus more on linking words to actions rather than memorizing lines. Again, students learned the vocabulary and phrases through TPR and TPRS and then used their skills to complete this InfoGap activity. 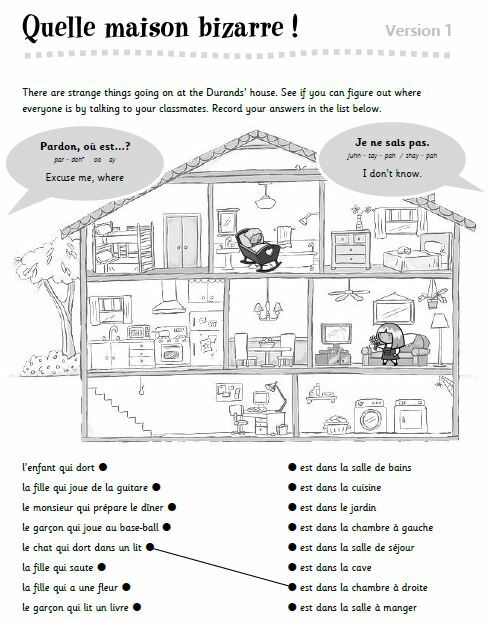 As they talk to classmates to find out what ails them, they’re reviewing body parts and the expression avoir mal while scaffolding on the handout gives them pre-exposure to contractions with à. In this video, you’ll see a trial run of sorts. I had one group of students who always got to class really early, so I asked them to try a scenario where one student pretends to be the teacher while the others follow her directions. This is a really common InfoGap activity. Students ask each other questions to find out where their family members are around the house and what they’re doing. They’re reviewing multiple skills that they learned through TPR, including family members, at-home activities and prepositions.